Thanks for another great National Sewing Month! These are our favorites from the month. Since we shared over 30 pages for National Sewing Month in 2018, we thought we'd make a page that includes our absolute favorites. Every page this year was full of information, free projects, or video tutorials, so there was something for everyone. We even had a few no-sew projects for the people who want to celebrate #NationalSewingMonth but aren't ready to pick up a needle and thread just yet. We thought we'd narrow it down by choosing our top 13 designer-created pages created exclusively for this year's celebration. This year we had four main themes: tips and tricks, Christmas, refashioning, and printables. Each day of the themed week, we'd share at least one new page. It could be a collection of free sewing patterns, a guide on a certain technique or material, a new project or free pattern, or tips for sewing. We are so grateful to have such an amazing community of sewists who are willing to step in to help. Plus, they offered so many National Sewing Month ideas that we had a ton to share this year! Even though the celebration is over until next year, that doesn't mean you can't catch up! This page is the AllFreeSewing editors' choices for the Best of National Sewing Month 2018 and we think you'll agree that these are not to be missed. No matter what you are looking to create, you will find a page that has something interesting and intriguing. So, take a look and see what sparks your creativity best. Rebecca from Purple and Lime created this wonderful guide for us called How to Sew on Sequins: Tips and Techniques for Adding Sparkle. It includes everything you've ever wanted to know about sequin sewing. This is a must-read for die cutting fans or those who are looking to buy one. Die Cutting Tips and Tricks: Make Sewing Magic with Die Cuts by Ann Strecko Koeman from Ann Makes includes everything you need to know. How to Plan Sewing Christmas Gifts by Rose Johnston from Threadbare Creations is such a helpful guide for anyone who wants to go DIY for the holidays. Figure out how you can plan out your schedule and get ideas, too! We asked Rebecca from Purple and Lime if she could create a second page for us to celebrate Christmas week. Inspired by the Hygge life, this Scandinavian-Style Christmas Felt Candle Garland is super cute and minimal. Ann Wilson from Tea and a Sewing Machine always goes above and beyond for National Sewing Month. This year, her Vintage Christmas Wreath Beaded & Embroidered Ornaments are seriously the prettiest ornaments ever. AllFreeSewing had some in-house help from Jenny Bowden for this Easy Sock Snowman Tutorial. We even did a Facebook Live video that's at the bottom of the page. This fun project is great for kids and will look great in your home during the holidays. This Easy Men's Shirt to Women's Shirt Refashion is a how-to from Mary Beth Temple. She did a video tutorial and we also have a written tutorial with all the details there, too. This t-shirt refashion allows you to buy a cheap shirt that's too big and make it fit! If you're into vintage styles and thrift store finds, you will love this Vintage Hat and Bag Refashion. Sarah Ramberg of Sadie Seasongoods shared with us how to go about searching for vintage pieces and transforming them into modern wearables. Learn how to wear a long scarf in the hottest possible ways with this gorgeous collection of trendy tying tutorials! With How to Tie a Long Scarf: 15 Fabulous Formations, Mary Beth and editor Erin Hoffman walk you through the motions. Plus, there's a free chart! AllFreeSewing editor Krista Childers created these cute and Kid-Friendly Felt Monster Patterns. These felt monsters are scarily easy to sew for either adults or kids and the full tutorial includes tons of different printable templates to make the process even easier! Krista Childers from AllFreeSewing also created these awesome Simple No-Sew Quilted Ornaments (with Printable Templates) that is a perfect no-sew project for the whole family. There are also several templates to print for making these DIY ornaments. HOO wouldn't love a stuffed owl? This Soft and Sweet Owl Plushie Pattern was created by Mary Beth Temple and includes the printable owl template as well as a detailed written tutorial and video tutorial. No need to wing it when there's so much to help! Check out this page of 10 Free Sewing Patterns for Cricut Maker + Tips & Tricks To Get You Using Your Cricut Maker Today from Crystal at Hello Creative Family. If you have a Cricut Maker or are thinking of getting one, be sure you read this article. 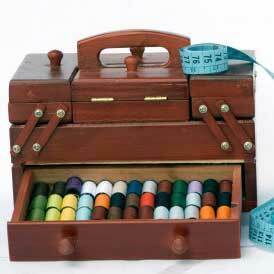 What was your favorite National Sewing Month theme?